As a podcaster, your stats are your proof. Depending on what platform you use to publish your podcast you get to know things like geographical data, traffic sources and numbers per episode but it’s still hard to know how many subscribers you are. So knowing that there have been over 100,000 downloads of it AMAZING! My host, Libsyn has just changed its stats making it possible to learn even more about you, my listener – which is even more exciting and sets me up well for some new partnerships in 2018. I’ve had another brilliant year hosting this podcast. I feel in a very privilleged position to get to speak to the people I do. To be honest, I am constantly amazed at challenges I learn about in the chats I have, about what you have to overcome on your journey’s to become a parent. Including coming to terms with the fact that it’s not going to happen. When I think about our journey I know how blessed we were that our fertility treatment worked first time. However I feel I deal with the repercussions of infertility more often than people might realise. When I see a friend pregnant with their second is tricky. I wrote a blog about it When I hear someone has gone back to work full time, I am jolted into the realisation that I’m little bit more skint than them, as I’ve chosen to work part time so I can spend as much time as possible with my son, whilst he’s interested in me.I know that my career choice has changed as a result of our infertility. I walked away from my role as broadcaster on a national radio station, as I wanted to dedicate more of my headspace to this podcast. I know there is so much more content to create about this topic, so many more ways to reach out to you, my community, the 1 in 6 of us all around the world who are struggling with infertility in the many different ways it affects us. So amongst the different ideas I have to engage with you, I now created a closed facebook group called Talk Fertility which I invite you to join. It doesn’t matter what stage you are at, but if you want to talk about your journey, your struggles this is going to be a place where we carry on the conversation. I know there are a lot of support groups on facebook and what I will say about this one is it will be moderated by myself and several of my fertility friends who all have a story to share. Whilst I’m no expert I’m constantly speaking to those who are and learning more and more about the industry. Also, having created over 100 episodes, I now know a lot more people and there are a lot more people I can reach out to which I will do – for you. As often as possible reach out to these experts I speak to on my podcast asking their opinion on topics being discussed and ask them to join in the group to talk more. I think it’s going to be really interesting. 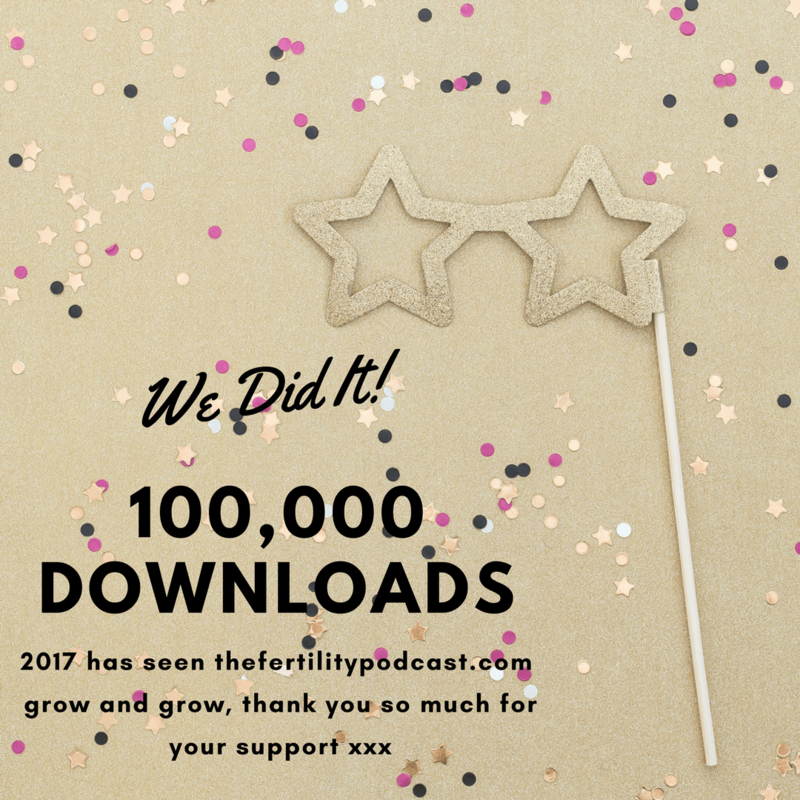 The post 100,000 downloads for The Fertility Podcast appeared first on The Fertility Podcast.